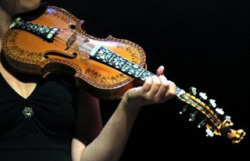 The most characteristic feature of the Norwegian Hardanger Fiddle is the four or five sympathetic (resonance) strings. These run through a tunnel cut underneath the fingerboard, below the four regular bowed strings. Moreover, the sympathetic strings vibrate together with the upper main strings when the main strings are bowed, which creates the instrument's special sound. In addition, the bridge is flatter, making it easier to bow two or perhaps three strings simultaneously. The origin of the hardingfele is a major topic of discussion. One theory holds that it developed from European instruments such as the violin and the viola d'amore (a fiddle type from the gamba family with sympathetic strings). Another theory holds that the hardingfele is a further development of the medieval bowed instruments fidla and gigja. The oldest hardingfele may be the Jaastadfela from Hardanger, dated 1651 and located in the Bergen Museum, although this has been disputed. The earliest hardingfeler were made in the area of Hardanger. The hardingfele is characteristically decorated with mother of pearl inlay and pen and ink acanthus designs on the top, sides and bottom. Traditionally the hardingfele is a solo instrument used for dance playing, listening tunes and song melodies, but recently it has become more common to use hardingfele in ensembles. strings are tighted under the four melodic strings to make a rich and pure sound. 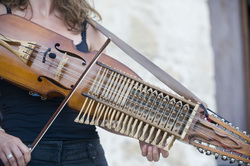 The Cretan lyra is a small, pear-shaped, three-string fiddle, held upright and played by stopping the strings from the side with fingernails, widespread in Crete and the Dodecanese. The island of Crete has been the center of the transformation of the old lyraki, a small model of lyra devoted only to the performance of dances, into the modern lyra, commonly found today throughout the island (Anoyanakis 1976: 259). This transformation took place long ago under the influence of the violin, even if it would be difficult to say when and why. According to Papadakis, the violin seems to have been the main musical instrument in the province of Chaniá in the nineteenth century, while until the second half of the twentieth century in Western Crete, the lyra was played mainly in the province of Rethymnon (map). The history of bowed string instruments in Europe dates back to the 9th century with the lira, and different types of violins and fiddles developed in Europe in the following centuries. During the 16th century, different forms of bass violins were developed. The cello as we know it has been in use and developed since the baroque era. The modern instrument has a stronger tone and a brighter sound than the baroque cello, and has made its way from classical music into several genres such as jazz, rock, pop and traditional music. 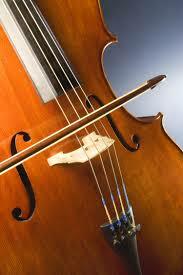 Thanks to the range from bass to high tenor pitch, the cello can be used very flexibly in an ensemble. In TOKSO, the cello is the only instrument that doesn't have sympathetic strings. The size of its body and the deeper pitch nevertheless give the cello a big, sonorous sound that creates solid ground for the other instruments to play on.